A prophet is never well-accepted in his own country. Talking about prophets and saints, we tend to have in mind people who did great things, have great intelligence, smart, holy,etc. The one who speaks well in front of the crowd but cannot be from our same town or neighborhood, not even our peers or companions. Today, while reflecting on the Gospel, I am reminded that these people are in our midst, doing small, ordinary or even insignificant things. They might not be of the intelligence we expected or as smart. How often do I seek to listen and praise only people who speak well, who do great things, and take for granted the saints in my own community, family and Church? 3. Instead of "giving" to God right away, ask God to journey together through this problem. This applies to sickness and all others problems in life. Just like Blessed James Alberione, our dearly beloved founder of the Pauline Family. He saw the problem in society during his time, how people abused the press. Not only did he accept that this problem existed (still existing), he prayed and offered, at the same time allowed God to work with him and took actions to counter the problem(s). In any social group, organization or even in community, have you ever notice at times when someone is alone or left out by themselves? What is your first reaction? I am sure it is not hard to realize that many times our first thought would be: something is not right with that person that is singled out. Perhaps he or she is angry with the group. Maybe he is withdrawn, does not like to be in the group. Maybe she is a loner….. maybe, perhaps, maybe……. The focus is always that single person. Have we ever stop to think that perhaps the problem does not lie only on him or her? What about the majority, i.e. the group? Don't they have a part to play too? Have they try to reach out to that person? Perhaps unconsciously because of their "group", they excluded him? Instead of judging right away that that person has a problem, perhaps we can stop to think if the problem lies also on us. A little smile, a little word of acknowledgement or encouragement, at times even a hug can open up the wonders in every person. It takes both hands to clap. At times we can be the single person, and another time, we might fall into the majority. Don't think that only the single person is closing himself/herself up to the group. Even a group can be exclusive and closed themselves to the "outside" world. I am not a psychologist or sociologist, but this is just my personal thoughts. <<Che cosa cercate?>> è la sola domanda che guarisce davvero. E significa: Qual è il tuo nome? Tu, come ti chiami? E diventa non: Cosa devo fare? Come devo essere?, ma: Chi sono io? Che cosa vive in me? Che cosa succede nella mia anima? Con questa domanda Gesù mi concede perfino il diritto di essere debole, di non essere un forte, di non avere tutto chiaro. Io ho il diritto di essere debole, altrimenti non avrei neppure il diritto di desiderare, né quello di cercare, e neppure quello di pregare, di chiedere aiuto, di alzare le mani nell'atto di chi cerca di afferrarsi alla roccia sicura quando l'acqua lo travolge. The car stopped at the light. A cap appeared in front of my eyes. his eyes looked on with eager. Many times I would just sit and be still. This time my heart spoke otherwise. I looked at those eyes: humble and sad. I remembered I do have a loaf to offer. A snack passed onto a pair of filthy hands. Without a word but a little gesture of thanks. turning our way and took a peek. how did he end up in this form? we may have a chance to offer our "loaves". It maybe a little loaf, but it filled both - his hunger and my soul. How many loaves do you have? you asked. but whether am I willing and ready to offer even the little that I have. Our professor gave a very simple example on discernment today. Someone felt called to give his life to serve the poor. A voice told him that he does not have to give his life to do that. All he could and even better is to set aside what he earn to help the poor. Both are good. But which is better? There is a closer following in the footstep of Jesus, but temptation lead us to give lesser of the good. Today, our sister-congregation, the Pious Disciples of the Divine Master, celebrated their 90th anniversary of foundation. 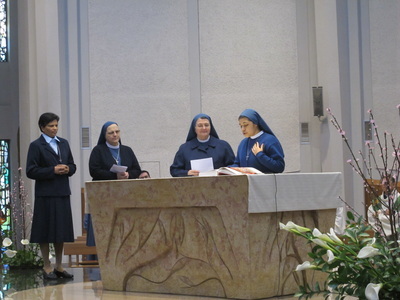 At the same time, it is a day of thanksgiving for their first Superior General, Mother Scolastica Rivata, being proclaimed Venerable last December. 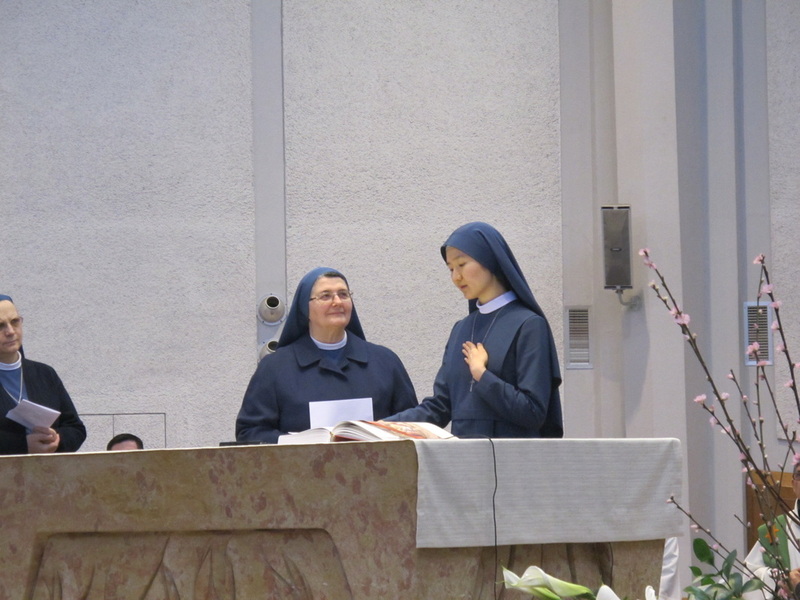 Adding on to the celebration, here in Rome, 6 temporary professed sisters, coming from Korea, Venezuela, Ukraine and Italy, renewed their vows. It was really a family and international celebration, with our Pauline priests as the con-celebrants, and other members of the Pauline Family, gathered at the Church of the Divine Master. 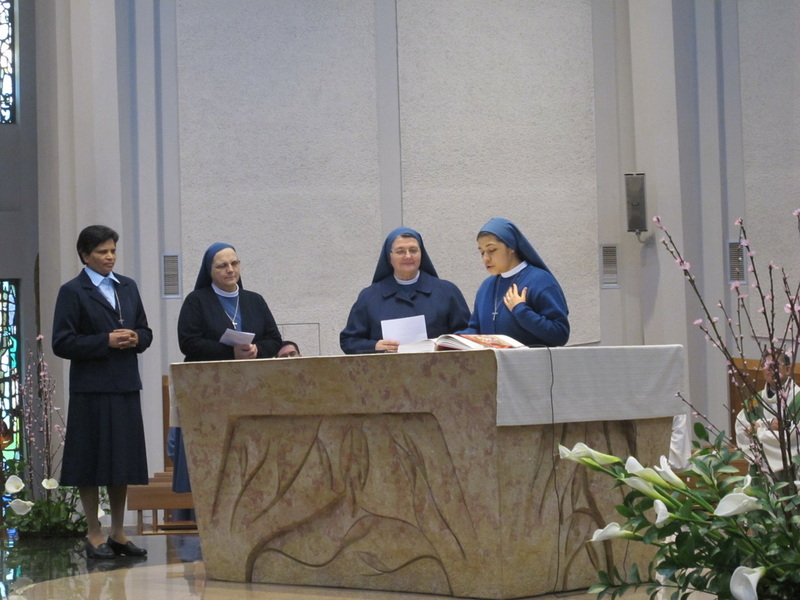 Monsignor Angelo Amato encouraged the sisters to study more about Mother Rivata, her life and to imitate her humility and obedience. To find out more about PDDM, click here. 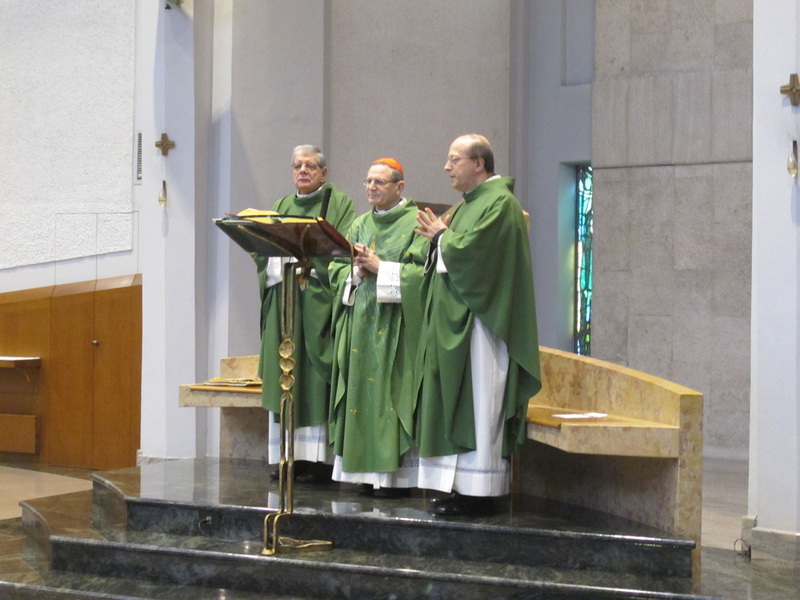 Today our congregation celebrates the 50th Death Anniversary of our first Superior General, Prima Maestra Tecla Merlo. She had been a great collaborator of Blessed James Alberione in the foundation of our Congregation and also assisted him in many other initiatives in the Pauline Family. She is considered to be the Co-Foundress of our Congregation and was declared Venerable in 1991. 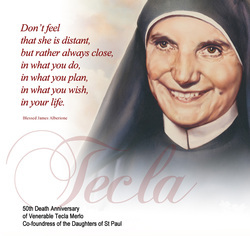 Find out more about Venerable Tecla Merlo, click here. Daughter of St. Paul since 24 June 2000. Born in Singapore, now mission in Perugia, Italy.